Escu House in Sydney’s Belrose presents an open, inviting and contemporary architecture that is intelligent yet simple, and confident yet subtle. 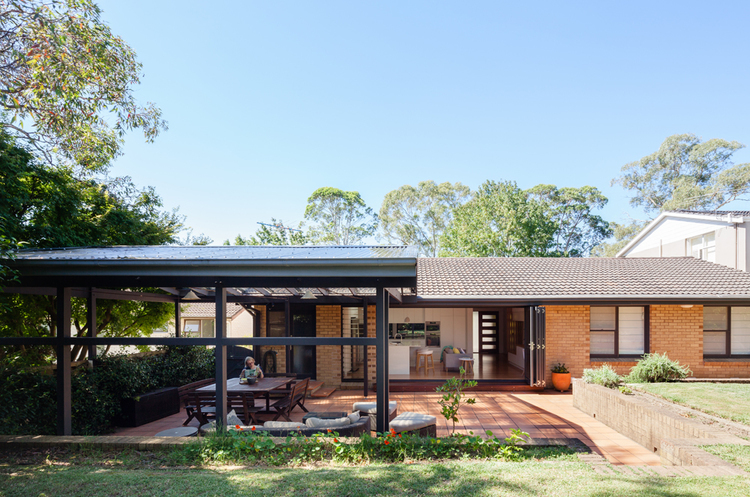 Through a program of spatial rearrangement and a layering of joinery and finished elements, Bijl Architecture has completely transformed this 1970s pale-brown brick structure into a light-filled, highly functional home that is also warm and welcoming. 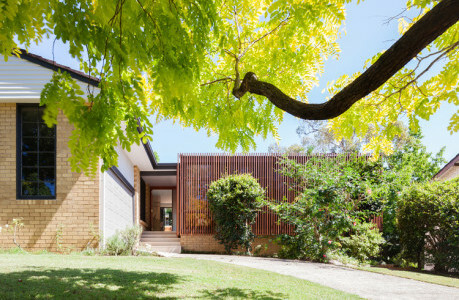 At the front of the house, an existing verandah has been replaced with an extended front living space, protected from the street by a vertical slatted timber element that acts as part privacy screen and part floor-to-ceiling balustrade. Wrapping the room, this façade treatment lets northern light into the front of the house and allows the windows to be opened wide while retaining a buffer from the street – Escu means ‘shield’ in old French. 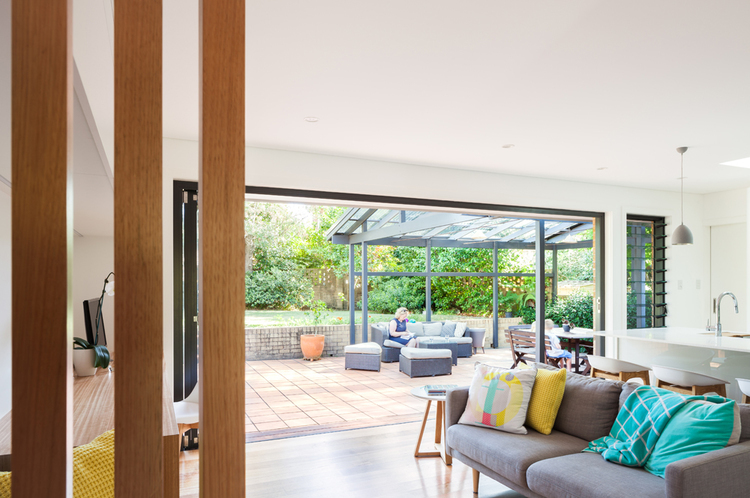 Inside, the interiors are open and light, with the exterior slatted screen visible from inside the front living room where the timber combines with the outside greenery to create a sense of connection to nature. The opposite wall provides a strong contrast in dark teal, framing either side of the room, while an original David Trubridge pendant light provides another accent of timber above the dining table. 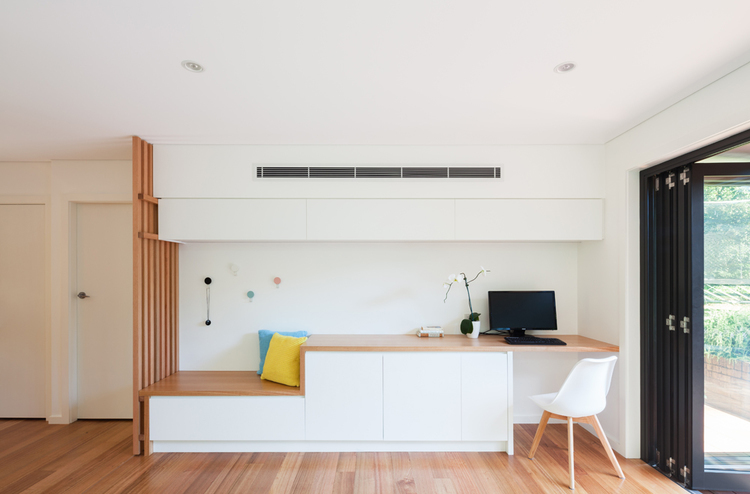 At the back of the house, a kitchen and open family room features concealed storage and built-in furniture, including a long timber joinery element along the back wall that contains seating and desk space. A fresh palette of timber and white features subtle pops of colour, such as the geometric tiles in the kitchen splashback where blue, yellow and grey create an understated decorative effect, and hooks by Design by Them in soft shades of blue, pink, black and white. 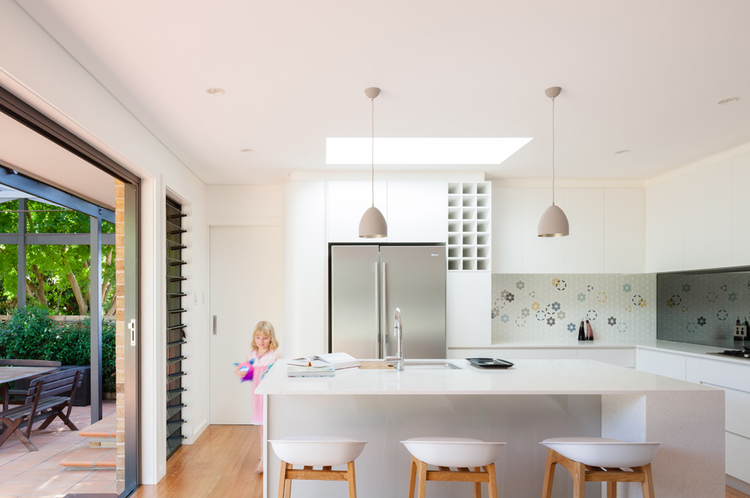 A considered approach to the allocation of space focused on the reality of the family dynamic, in addition to a balanced application of joinery and materials, has created a highly functional home that provides an oasis from the outside world for a family of four within a small, intelligent package.